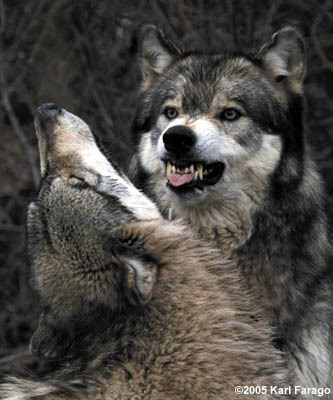 Social structure is complex and organized within the wolf pack, with each member playing a dominant or submissive role to the next wolf in line. At the top of the social pyramid is the alpha pair, followed by the beta pair, then the other adult wolves in various degrees of submission, and the young. At the bottom of the pack's social structure is the omega wolf, which often endures being picked on by the other members.